I've been doing a lot of thinking about how marketers can optimize their lead engagement to deliver more opportunity-prone prospects to their sales departments. A growing number of B2B marketers have marketing automation technology to help them track, score and connect better than ever with their lead database. Discovering who your hottest prospects are and getting them to sales at exactly the right moment is becoming easier. This is a great thing for both quantifying marketing efforts and for generating higher alignment with sales, but what I'm wondering is what happens when the frequency and recency of a lead's engagement stalls? Mostly what I'm seeing is that these leads are rolled into a "general" touch campaign with the intent of keeping your company in the lead's mind so that when something changes, they can re-engage. But, I'm not sure that's the best first response. Consider the profile of a lead who was hot and heavy with response to your content and communications who has either stopped completely interacting with you or has turned into a sporadic responder. Has your position in the company changed? To...? Was the project put on hold? Did you already solve this problem? How? Did our content cease being of value to you? Why? Knowing the answers to those questions can present options for handling the lead that go beyond just dumping them back into the general nurturing pool or dropping them completely. The way you choose to handle how you act can actually add relevance for the lead, bringing them back—depending on their answers to the above, of course. If the lead is still responsive, but only sporadically, take a look at their activity profile and try to determine what changed. If your content changed focus around that time period to a different problem/solution scenario, your information may have become less valuable to leads interested in previous topics. Look at the content they are still responding to. What similarities exist between the lead's content choices? Given the answers to those questions, can you create a 1-to-1 interaction that enables you to learn more? The point is that buyer behavior changes and evolves continuously. If you're seeing a growing percentage of people retreating from your communications, perhaps something has shifted in your marketplace that you've missed. Maybe some new problem scenario is now the urgent priority and you missed the shift. Doing some investigation into why these lead behaviors are occurring can help you ensure your emarketing strategy stays on track because your relevance never wavers, or at least not for long. And finally, look and see what options your marketing automation technology offers to help you track frequency and recency and how you can start using those insights for more than a tool to reroute your leads into the general nurturing pool. After the marketing-to-sales process is complete, the two should get together and conduct a debrief about the experience. Whether you won or lost the deal, there is a wealth of information to evaluate for competitive insights that can improve future emarketing efforts. Often, this process is done by sales on their own or with their sales manager. However, this is a key moment for marketing to gain intelligence that can help them tweak and tune their content marketing strategy. If you can involve the customer you gained or the opportunity you lost, even better. Because sales has face-to-face insight, they can tell marketing things they'd not know otherwise. Body language, facial responses and enthusiasm levels are something marketing often only sees in virtual form. In fact, if it's at all possible, meeting with salespeople during their engagement with the opportunity can help marketing capture critical response data at different points in the process when it's still fresh in the salesperson's mind. Sure, you can't do this for every sales activity, but consider trying it on a few choice ones and see what you learn. An example would be to try this with a salesperson actively engaged with a prospect in a target segment where you'd like to expand your market. How many attempts did it take for you to get in contact with the prospect? And, what worked - email, phone - combination of the two? What's the problem the prospect needed to solve? Peripheral problems? Were there any points of confusion they needed to clear up? What risk factors were they concerned about? What expertise do they need that they don't have in house for this project? Which competitors did they mention? What had their attention? Was there any point in your presentation where their body language told you they were losing interest? Was there a point during the meeting when their enthusiasm became prominent? As you read the questions above, did you see all the opportunities for insights that can help you create high-value marketing content that will increase your probability for higher engagement with that target segment? Armed with the answers, go back to your prospect's activity profile and assess what content and communications they'd been exposed to during your emarketing and nurturing campaigns. 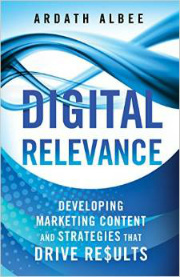 How can that content be improved to add relevance for future campaigns to that target segment? In today's marketplace you cannot afford for marketing to be guessing about what's effective. Especially when sales can easily provide these insights. In order to flesh out customer profiles and personas and get to a level of personalization that builds consistently higher engagement, you've got to get down to the nitty gritty in your intelligence gathering. Sales can help. Ask them. 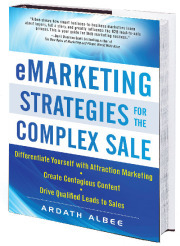 After all, if they help you and your marketing efforts shorten sales cycles, everyone wins! As more and more marketers and salespeople grapple with how to segment their leads and personalize their messaging, the question of demographics is asked. If you've created an emarketing campaign lately, you've likely been asked, what's the customer profile you're targeting? Those definitions are what companies use to decide whether or not they want a prospect. The problem with this approach is that it has nothing to do with the prospect deciding they want you, your products or solutions. Nothing. It's interesting to note that even with all the customer-focused strategy discussions, companies still behave as if this process of selection was all about them. And, sometimes it may indeed work out that way. But, before you start thinking "see, I'm okay, no need to change my thinking about this," chances are those customers tend to be the ones you talked into buying instead of the ones who were actually interested in buying from you in the first place. These are the ones who can turn into demanding, unfriendly customers—so far from your favorite, ideal customers that, after a while, you pray they'll defect. They also tend to be the ones who have the lowest net margins for profitability. 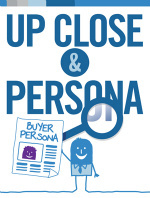 When you think about customer profiles from now on, think about them in relation to Catch Factors. Catch Factors are the preferences and aversions that form a prospect's gut reaction about your company, products, messages, brand and communications. Urgency. Define why a prospect will need your product, solution or service now. Why is paying you their attention critical for them today? What factors about their situation make it worthwhile to change their status quo sooner, rather than later? What are the business problems they're facing that must be dealt with immediately to reach strategic objectives and gain critical business outcomes? Impact. Assess the value your prospects will both receive by choosing to work with you and gain for themselves because of that choice. What overall business value will your prospect achieve if they act on their urgent priorities by choosing your company as a trusted advisor? What expertise will you bring to the project that will have a lasting impact on the way they accomplish their business goals? How will their professional status be changed by this choice? What values will be delivered that reach farther into the enterprise than the immediate project? Effort. Evaluate the difficulty of taking action from the prospect's perspective. How hard will they think it is to pursue solving their urgent problem or take advantage of the strategic opportunity under consideration? What will they perceive as obstacles that require too much energy to overcome? How can you make it easy for them to choose to engage with you? What do your prospects currently think about or know about your company? In what ways can you make lasting impressions that build a solid presence with your prospects? What will they likely hear from their peers and colleagues if they mention your company and how can you impact that? Intent. Transparent actions you can take to elevate your credibility with your prospect. What can you do to demonstrate you walk your talk in a way that provides value to your prospects? How can you expose your expertise to become a trusted advisor? Why would your prospects turn to you to help them solve an urgent, priority problem with high impact to their company's business outcomes? What will your prospects think you want from them? Every campaign has a foundational goal. By starting with that goal and asking and answering the questions for each Catch Factor from the prospect's perspective, you'll begin to see a pattern emerge that will help you formulate a customer profile that enables you to determine just who has the highest potential to be interested in your information and interaction invitations. By creating your emarketing strategies around the scenarios you develop during this customer profile process, you'll gain great insights to what truly interests, concerns and motivates the prospects most likely to become your ideal customers. And isn't that just what you need to know. There is just one caveat. This isn't easy. It'll take research, conversations, listening and exploration to discover the best answers. It's not as simple as going to Hoovers and pulling a demographics-based list. Or just blasting everyone in your database. So, why should you do it? Because by undertaking this type of exercise as part of your overall emarketing strategy you'll get to know your customers. You'll start seeing your prospects' situations from their perspectives. You'll be in a prime position to add needed value. You'll know who they are, what their priorities are, and how to serve them in a way that makes a lasting, positive impression. You'll get their attention--and you'll be able to keep it--all the way through their buying journey. Adding value is what generates relationships. And, it's very hard to add value if all you have to go by is statistical demographic information that does nothing to help you get to know who you're selling to. The truth about demographics is that they're an internal assessment tool for statisticians. Demographics have their place, but not in defining who your customers are or how to structure the effective components of a successful, interactive emarketing strategy. Are you treating your "friends" like prospects? I was reading my latest Wired magazine and found an article by Scott Brown, Facebook Friendonomics. He talks about the idea that friending has taken over the roll of the rolodex. He also laments the fact that he's never been un-friended, nor has he ever un-friended anyone because, well what kind of a jerk would actually do that? And, Scott says, "we've lost our right to lose touch." It's a great article, go read it. And then think about what it may mean to you personally. For the sake of a marketing-focused blog post, let's flip this to what I've noticed a lot of lately. Professionals are running around gathering connections on LinkedIn like they're status symbols. And some have begun marketing to them. What makes me suspect some of them don't really know each "friend" is the increase in emails from "friends" that have decided to blast messages to all of their connections. I've gotten several of these lately, but not once have they been "me" focused. These messages have pretty much been blasts of self-serving announcements about the senders' webinars, resumes, job searches, products and solutions, trade shows, the best-of-their-blog link lists or other things that are not of much interest to me. They all seem to be geared toward gaining more attention for themselves. Which leads me to wonder if all this friending is akin to putting yourself on new market-to-me lists. I mean, what's the protocol when you meet someone in person and they give you their business card? Depending on the context of that meeting, you'd file them away to call when something of mutual interest crops up, or to schedule a meeting if such intent were expressed. But, would you run back to the office and add them to your newsletter subscription list and drip marketing campaigns? Don't get me wrong, I like having friends. Lots of them. I'm just trying to figure out why some people think it's appropriate to blast messages to all of us—without regard to our individual interests—you know, like old marketing tactics used to call for. What happened to the respect that "friendship" implied? Scott Brown expressed an idea about having "friends" fade away over time if they've sat dormant for a while. I'm thinking that it might be appropriate to have a widget that allows you to warn connections that send stuff you're not interested in that you're losing that loving feeling as they watch themselves fade away from your connection list or you from theirs. That'd be something of a relevancy wake-up call, now wouldn't it. What I like about having connections is that when I need a resource for a project, or want to keep in touch about something relevant to both of us, or even ask for an introduction to someone they know that I'd like to meet, my online rolodex has a better chance of including up-to-date information than my older version or even my cell phone or PDA. Another thing I use my rolodex for is to ask for industry insights from my "friend's" perspective. By respecting their position and expertise, I've found I can learn a lot about different things. And, all that knowledge helps me create better-focused campaigns for my clients in those industries—sent to people who actually want to hear those messages. I've also met a lot of people that I might not have otherwise met, and am the richer for getting to know them. Plus, if I really like you, I'm probably already following your blog or your tweets. So, the next time you feel that urge to send out a blanket blast to all your "friends" from a social networking community, perhaps it would be wise to ask yourself if you're treating your "friends" like prospects? And then curb your enthusiasm. I read...a lot. Mostly on the web, although I'm a Prime member of Amazon and run through a fair number of books, as well. I've been noticing lately that, in order to keep up, I've become a scanner. I've also noticed that people I talk with have become scanners. You can tell when you're discussing something they've read and they only remember the highlights. It's a self-preservation move. There's simply too much information to keep up with. Start by making your paragraphs short and to the point. Lead with a hook and pull your readers forward quickly with valuable insights. Make it really easy for them to engage. When you're writing your marketing content, consider the difference between low effort elements and high effort commitments when you make your formatting choices. These are formatting elements that help your audience scan, see value and decide to read the body of your content because they find meaning fast. These are formatting choices that cause your audience to re-evaluate their decision because they're now focused on expending energy they didn't count on instead of being engaged easily by the meaning within your words. It's very hard to write concisely. Have you noticed when you try you find yourself holding on to every precious word you've written down? Cut ruthlessly and change those 40-word sentences into something easily digestible. One good tip is to read what you've written out loud. If you can't read your sentences without stumbling or stopping to take a breath, what experience do you think your reader will have? It's really important to consider who your marketing content is designed for. Not only in topic, but in format. In fact, I'd stipulate that it's more appropriate than ever to think about how you construct your content from two reader perspectives—the scanner and the intentional reader. Give people a choice. Let them know up front what they'll get if they choose to continue reading. To do this effectively, not only do you need to know your audience, but you need to know what's important to them and where the value lies within the context of your marketing content. Today's great marketing content is all about weaving together high value with low effort. This doesn't mean I'm not going to drop everything to read really well written content that has a valuable takeaway for me. It means I just don't find that kind of content very often. Neither do your prospects and customers. There's a great opportunity out there for marketers who can create compelling content designed just for a targeted audience. Why is this so dang difficult? The time for companies to try and be all things to all customers is past. Not that it was ever a good idea, but with the power shift to customers going on today, being ambiguous and wishy washy doesn't leave you open for more opportunities, it reduces those willing to give you a shot in the first place. I was looking at a B2B website the other day and spent a lot of time trying to figure out what that company does. Yes, I kept thinking that if I clicked enough times, it would become apparent. I was waiting for that "aha" moment. After 15 minutes I still cannot figure out exactly what they do. My conclusion is that they want to make sure they don't box themselves in by stating something that might limit them. Here's the problem with being a generalist. It's really hard to determine expertise or specialty when there's no concise statement about the value a company brings to their customers. We streamline business processes, increasing your employee productivity. What do you mean by streamline? What kind of productivity increases? For what type of companies? We help you improve business intelligence for better insights. What's wrong with my business intelligence? Business intelligence in relation to...?? These type of statements make me think the company has no idea about whatever it is they think they're talking about. Companies need to be specific. Your prospects are simply too busy to try and figure out how you might have something they need. Either tell them...or lose them forever. Focus your content on business problem and solution scenarios. Define your customers so prospects know if they're in the right place. Show them what types of projects you excel at by including stories in your marketing content. Highlight value you bring which they don't (likely) have access to today. Make sure they know why they should believe you. Remember that status quo is a "known" place to be. To change it is considered risky. For a prospect to agree to evaluate options means there has to be a big payoff for them. Generalists don't deliver big payoffs. They deliver general, run-of-the-mill solutions. When you hire a vendor, I'm guessing that you think you've picked the very best person, or company, for the project. Chances are, that vendor has a well-defined expertise that you don't. Vague: We streamline business processes, increasing your employee productivity. Specific: We help you finely tune your hiring processes to ensure your company engages qualified, highly-motivated salespeople that hit the ground running with minimal ramp time. Would you have gotten that interpretation from the vague statement? Vague: We help you improve business intelligence for better insights. Specific: We help you design evaluation tools to ensure you've got the best insights and coaching options to keep your salespeople on track with your company's selling objectives. Those may not be perfect, as I created them from the ether, but you should get the point. My interpretation could have gone in any direction with the vague statements. But with the specific statements I know for sure if I'm in the right place...or not. But specificity goes farther than that. I'm able to extrapolate additional insights by reading between the lines. The more specific you are, the better able I am to visualize what your company will bring to the project. And, that's a heck of a lot more engaging than leaving me to wonder what your content means for me. Quite frankly, I haven't got the time. A specific answer is right after the next click of my mouse. When people start talking about communication delivery as being cheap or free, it's often indicative of the amount of effort they tend to expend. This is because the perception of FREE skews how you think about the tool. It's one of those "just because you can, doesn't mean you should" things. Marketing Sherpa recently surveyed marketers and learned that 48% of them don't place a high value on email, considering it either cheap or free. Interestingly they also said that the effectiveness of email was decreasing. These are probably the marketers who send out mass, product-oriented, company-focused pablum and hope for the best. Only they're disappointed by the metrics and results. Treating a powerful tool with a lack of respect turns on you every time, regardless of what it costs. Each one of those things impacts the relevance interpretation by each individual recipient. Are any of those components free? Nope. Not a one. At least not for the 48% who place a high value on email, of which 75% say they're seeing increased effectiveness from their email initiatives. They may use inexpensive tools to deliver the communications, but because they produce valuable results from their efforts, they invest more in ensuring those results continue to improve. They're paying staff or outsourced talent responsible for developing those concepts, creative and content. They're investing with time and expertise to develop messaging that resonates with their audiences. They're also likely investing in research into analytics, customer behavior and responses to determine which messaging is more valuable and engaging to particular segments of their lead database. And then they're designing emails that deliver value to those segments. None of this is free. But it certainly is a valid investment capable of transforming the level of engagement developed with a higher percentage of targeted recipients. How about you? Are you seeing your email effectiveness increase or decrease? What reasons would you assign to that outcome? Joyce McKee is giving away her info-filled eBook about Trade Shows, The Secret to Achieving Brilliant Returns at Your Next Event. I've read it and the eBook contains a wealth of information I wished I'd had ages ago. 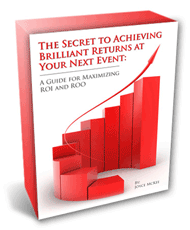 According to Joyce, there's a formula for getting the best returns from an event. She lays out exactly how to go about doing this in the eBook. It's a great value and I'm pleased Joyce has decided to offer it to you as a complimentary download. Go get your copy here - click on the eBook on the right side. Oh, and stick around and read her blog. 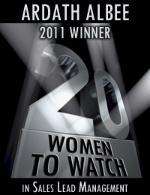 She's got great insights to share—far and above those included on the pages of her eBook. Given yesterday's post on the Customer Experience Impact Study, I thought you might like a chance to participate in the 3rd Annual Customer Engagement Survey and get a free copy of the results. How customer attitudes will change and what companies can do to deal with those shifts. 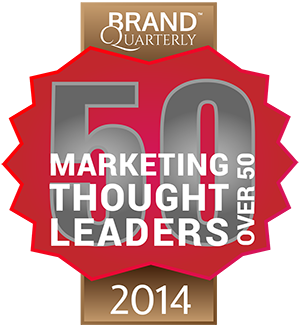 Evolving the definition of quality customers, given this changing landscape. The role of social media in addressing these changes. Last year they had over 1,000 participants in the survey and this year promises to be bigger, broader and more insightful than ever as they've broadened the reach internationally. Over 700 participated in the first 24 hours. Don't miss this opportunity to find out more about how to better engage your customers and prospects. Take the survey in English, Spanish, Greek or Chinese. But do it now - deadline to participate is October 21st. Thanks to cScape for hosting the research. I look forward to getting the results and finding even better ways to connect and engage in prospect and customer dialog in the future.